e27 started as a blog for startups but has grown to a platform that provides startups with knowledge, resources and connections to be successful. We fondly remember the Walkabouts, held on a Friday and a good excuse to wander around the startup communities in Ayer Rajah and Tanjong Pagar, and being plied with free candy, beer and pizza by the nation’s shoestringers. As part of their activities e27 now organise Echelon, a conference that combines a startup pitch competition with investor meetings, networking opportunities and chance for startups to present themselves to others. This year’s Singapore edition was again an eclectic mix of startups from all walks of life, with solutions you never knew you needed (laundry app anyone?). Here are a few highlights. Cash is for many vendors in the emerging markets still the only currency. NoCoinz, an Indian startup with a representative in Singapore, has developed a system that uses Nets-like cash cards and a payment token the size of a credit card. The token accepts payments from the cash card. The merchant only has to specify the amount and then hold the card against the token and the payment is deducted from the amount on the card. The token can also load the card. This allows any merchant to accept e.g. 50 dollars and then to transfer that amount for a client onto the card. The payment registration runs via GSM communication over the air and NoCoinz makes money through a tiny commission they take on each transaction. Manish Goel, co-founder of NoCoinz explains that this makes cash payments safer and simpler for both the merchant and his clients. Watch the video for a short demonstration of the card. Those of you have a used LinkedIn Sales Navigator to generate and find leads and do some marketing around your company, may share the observation that the use of Sales Navigator requires a lot of manual work. LeadBook addresses this issue by crawling data from LinkedIn and other sources, enhancing it and making it available through a sleek and focused search interface. The advantage according to Daniel Cassim, is that the data you get is richer, more complete and easier to navigate than LinkedIn. Right now they are very focused on Asia Pacific and they claim to have 15M companies with contact details in their database. They say that the data quality is enhanced through the use of data science and intelligence. The platform can be tested for free for a period of 7 days with 5 credits. You use one credit per company that you unlock to see the full data set. The use of beacons in retail is on the rise as well. Open Life, a Taiwanese company, has developed a promotion system that awards people when they find promoted products in a store. In addition the platform tracks the visitors who have installed the Open Life app and shares the data with the retailer via the POS. Malaysia based company Beely uses beacons to track the time customers spend in a store and rewards them per minute with points. The retailer can use the points for redemption or discounts. In the future they plan to use a Shazam style sound analysis to check whether users of the app watch a television advertisement or listen to a radio commercial. 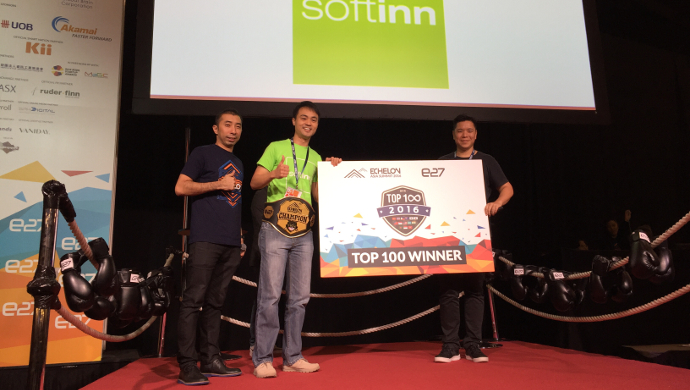 The pitch battle was won by Malaysia based startup Softinn. They call themselves an innovative cloud-based booking and inventory management system for hotels. They took home a platinum pass to all the Echelon conferences in 2016 and 2017. The next Echelon summit will take place in Bangkok in October, followed by one in India in November at a still location that is still to be announced. More information can be found on e27’s website.